What is the future for Scapholunate interosseous ligament reconstruction? Brachial plexus tumours are rare. It comprises of only 5% of all tumours of upper limb . The two most common brachial plexus region tumors are schwannomas and neurofibromas [2-4]. The term- 'Orthopaedics' was coined by French physician and writer Nicholas Andry in 1741, derived from Greek words for "correct" or "straight" ("orthos") and "child" ("paidion"). 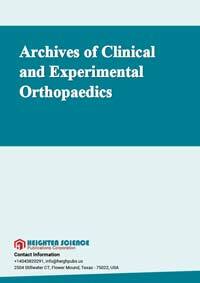 Archives of Clinical and Experimental Orthopaedics seeks to publish manuscripts evaluating broad spectrum of orthopedic conditions in clinical and experimental environment. The Archives of Clinical and Experimental Orthopaedics has a versatile approach in publishing latest researches in all arenas of clinical and experimental orthopaedics. The biggest issue facing orthopaedic surgeons in the coming years will be responding to change. To cite precisely, there will be an exponential increase in demand for orthopaedic procedures including arthroplasty. I am delighted and satisfied with. Heighten Science Publications as my manuscript was thoroughly assessed and published on time without delay. Keep up the good work. Submission of paper was smooth, the review process was fast. I had excellent communication and on time response from the editor. "It was a pleasure to work with the editorial team of the journal on the submission of the manuscript. The team was professional, fast, and to the point". Publishing with the International Journal of Clinical and Experimental Ophthalmology was a rewarding experience as review process was thorough and brisk. Their visibility online is second to none as their published articles appear in all search engines. The editorial process was quickly done. The galley proof was sent within a week after being accepted for publication. The editorial team was very helpful and responded promptly. Thank you and your company for effective support of authors which are very much dependable on the funds gambling for science in the different countries of our huge and unpredictable world. We are doing our work and should rely on a teams like Galley Proof-HSPC. Great success to all of you for the 2019th! Be well all the year long. Thank you for your attitude and support. I am sincerely grateful to you and the entire staff of the magazine for the high professionalism and fast quality work. Thank you very much! The services of the journal were excellent. The most important thing for an author is the speed of the peer review which was really fast here. They returned in a few days and immediately replied all of my questions. I want to refer this platform to all scholars. We thank to the heighten science family, who speed up the publication of our article and provide every support. In 2017, I submitted a manuscript to the journal Archives of Biotechnology and Biomedicine belonging to Heighten Science Publications Corporation. Within one week I already received the response from the editor. All processing steps were really fast so in terms of a speedy publication I can particularly recommend the journal Archives of Biotechnology and Biomedicine. The responsible contact person of the journal was always available, which gives a trustworthy impression to the author. Also the peer review process was clear and constructive. So from my experience with Heighten Science Publications Corporation I can recommend publishing there. The Journal Clinical Nephrology provides a good opportunity for readers to stay updated in the field of clinical nephrology. Additionally - it provides a good opportunity for authors to publish their work. Publication of the accepted manuscripts is sufficiently rapid. The trust factor between the journal and me, as an author, is very important and well preserved. Peer review process very rapid and effective. I am to express my view that Heighten Science Publications are reliable quick even after peer review process. I hope and wish the publications will go a long way in disseminating science to many interested in scientific research. Your journal has accomplished its intended mission of providing very effective and efficient goals in dealing with submissions, conducting the reviewing process and in publishing accepted manuscripts in a timely manner. Keep up the great work and services that you provide. I, Muhammad Sarwar Khan, am serving as Editor on Archives of Biotechnology and Biomedicine (ABB). I submitted an editorial titled, 'Edible vaccines to combat Infectious Bursal Disease of poultry' for publication in ABB. After submitting the manuscript; the services rendered by the management and technical personnel to handle and process the manuscript were marvelous. Plagiarism report was shared with me with complements before reviewers' comments, All steps including article processing and service charges were well taken care of keeping in view the author's interest/preference. All together, it was an encouraging and wonderful experience working with ABB personnel.